Thomas W. Rogers is an independent researcher, logician, and president of Reality Research and Development Inc., Lifetime Reference Guides Inc., and The Atomic Biology Institute. He has studied at three universities and two institutes. His work background is in engineering, research, construction, international manufacturing, and exploration. The education and experiences in these fields prepared him for researching and understanding the super-intelligent physical work required to design, construct, sustain, and maintain cell-parts, cells, and living entities. His primary focus for this primer is in detailing the basics of God’s phenomenal physical work in building cells, humans, and their foods, as the only recognized entity with needed super-intelligence, dexterity with atoms, speed, and enormous, reliable care for each one of us. Tom has been a voluntary director and president of various community organizations, including the British Properties & Area Homeowners Association, the Greater Vancouver Apartment Owners Association, the West Vancouver–Howe Sound Social Credit Constituency Association, and he is a soldier in the Salvation Army. Tom currently has memberships in the American Scientific Affiliation, the Canadian Scientific and Christian Affiliation, the Discovery Institute/ Center for Science and Culture, the Creation Science Association of British Columbia, the Christian Scientific Society, and the American Association for the Advancement of Science. 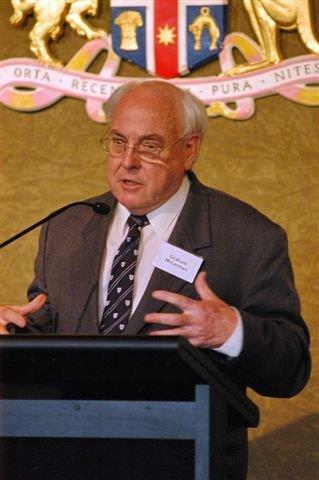 Dr. Graham McLennan is the author of Chapter 5: “God in the Government of Australia.” He received his Degree in Dentistry from Sydney University, where he also became a Christian. He served as a Captain in the Australian Army; received the Defence Medal and the National Serviceman’s Medal. Graham and his wife, Pam, founded the National Association of Christian Leaders (NACL) in 1973. In addition to being a dental surgeon and tutor at the nearby University Dental School, Graham is convener of the NACL; team member for the Australian Christian Values Institute and National Day of Prayer and Fasting; founding Chairman of Rhema FM 103.5, and Orange Christian School. He is also a founding director of UCB’s Vision FM, and of the Australian Christian Lobby, and has served on many other national and international Christian boards and charities, as well as authoring a number of Christian books and articles.